This sketch is all about pausing in a busy day to sit and draw, taking advantage of a little sun between rainstorms, and enjoying feeling free. 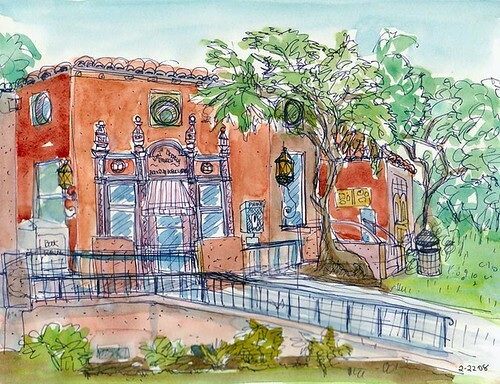 Until I began the sketch, I hadn’t realized how beautiful (and extraordinarily complicated) the landmark building (photo) of the North Berkeley Public Library is. My feeling of freedom came from filling three shopping bags with books I no longer needed and taking them to my favorite used book store, Black Oak Books. They gave me store credit for two-thirds of the books (which I promptly traded for three books I had on hold). I could have sold the remaining bag of books on Amazon or at another used bookstore, but decided to just let them go. I dropped them off at the library as a donation and walked out empty handed, feeling quite pleased. Instead of rushing on to the next task, I plopped down on a bench and started sketching. Now I have space on my bookshelves and room in my car (the three bags had been hogging my backseat for two weeks). And I love that wonderful spacious feeling that comes from removing clutter, whether physical or mental, from my life. About the sketch: As you can see, my study of perspective hasn’t quite paid off yet. (The doors and windows slant the opposite direction from the roofline of the front wall). I drew with a purple Micron Pigma pen and then added watercolor at home. I tried to remember the colors of the walls but realized I didn’t pay enough attention to what was in light and in shadow. To practice using visual memory, I purposely didn’t take a photo or look at one on line. So now I can see that my visual memory needs work, along with my perspective drawing. How great to know that there is no end to learning as an artist. I never have to worry about getting bored. Painting and learning are my two favorite things in life! Previous Post: Ladies, Stand Up for Your Right to Pee Standing Up! Jana! Oh how I envy you that ‘free’ feeling and findng a home for all those books!! I too need to do the same thing — but a 70 mile trip to the bookstore that might buy so many of my really super reference books, just is daunting right now … so doing so is definitely on my list!! CONGRATS! And oh how I love your building!!!! I find it utterly charming, Jana — just the way it is — with that sketchy feeling of line and wash I just LOVE!!!! Congrats too on pausing for the day. I spent all night (only 3 hours sleep), going to work (3 hour drive) and working more (still doing so) on all my computer issues — I think (fingrs crossed) — we’re close to finishing .. I sure hope so! Congrats, cara, I really want you to know I love your sketch! Your building looks remarkably straight after the one that I drew today (no I didn’t post it). I do love all the details you’ve added in this, and I like imperfect drawings they have so much more character! It is a wonderful feeling to get the clutter cleared! Great way to celebrate! What a great sketch! And of a building I know so very well. Nicely done. Charming sketch. I have those same visual memory issues. I can really relate to that. I agree that one of the best things about making art is that you can never be bored. There is always something to learn or practice. I love it. Could you please come and sort out my bookshelves please. I really like this one and the next one. There’s something about doing portraits of buildings and shop fronts – windows on their souls maybe? This building is so cute it could be made out of gingerbread!